Bill Monroe style bluegrass, 5-String banjo, mandolin, viola flat picking, acoustic bass and even cross picking will be available. The sessions will take place February 11, 2012. This will be a one day workshop that we will explain the basics of bluegrass, the instruments, the history for both musicians and fans. Everybody is welcome. The São Paulo Bluegrass Music Association promotes acoustic music and helps to inegrate the music with their own national music segments such as the Brazilian choro, valuing the artist musician, honoring traditions and creating presentations and events of gratifying cultural recognition. The last bluegrass workshop that the Sao Paulo Bluegrass Music Association had was about ten years ago and Erio organized that. And now, Cesar Benzoni has recreated the Bluegrass Experience. These workshops are not only for musicians, but for fans and people that are curious to know what is bluegrass all about. The course is going to explain the chronology, talking about fiddle tunes, Bill Monroe and his influences, Earl Scruggs and his 3-finger banjo picking style and a summary about those three generations. 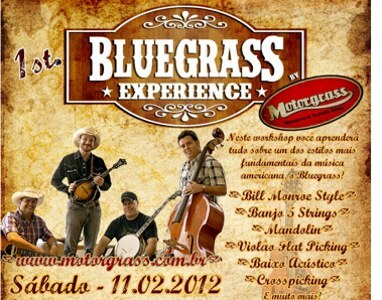 São Paulo Bluegrass Music Association is promoting it and Motorgrass, Cesar Benzoni's band, will lead the workshop. It's happening on february 11 at 2:00a.m. at H-Unit, that is an school of music. If you're interested in a multi-cultural experience, contact Cesar Benzoni at cesar@bandablacksmith.com.br or visit them on the web at H-Unit.com for the full flyer (in Portuguese).